Vlad and Gus, forensic web analysts from the Web Detective Agency, are examining some website traffic reports from one of their clients. Vlad has spotted a problem. Vlad: There it is again. Vlad: The number of visits has dropped to zero between 1am and 2am. Gus: Well, that’s quite possible. Most people are visiting this site during the day and at weekends. Vlad: That might be plausible, but how do you explain the fact they had 213 visits from midnight to 1am, and then 99 visits from 2am to 3am? Plus, this is happening two or three times a month. Gus: Well, we should alert the client and get him to give their hosting supplier a hard time. Vlad: Yes, of course, but I think the actual performance of the website, including availability, speed and errors found should be something we should be reporting on to the client. Gus: But we’re not responsible for these things, and secondly, our job is to help optimize the visitor’s website experience, not get involved in hosting and tuning the web server. Vlad: Gus, you’re right in one way and so wrong in another. If the visitor can’t reach the website, or is getting loads of Error 404s ..
Vlad: Pages not found. What I’m saying is that the technical performance of the website is inextricably linked to the website experience. Not only that Google are now paying attention to your page load speed, and have a got some tools to identify ways to increase the speed of your website. Gus: What do you mean paying attention? Vlad: One of the factors that will determine where your website will rank in Google is your page load speed. Gus: What kinds of tools are available? Vlad: Assuming you’re using Firefox, you need to install Firebug, and then download a script called Page Load Speed. Once that’s in place, you simply press F12 you are on any website and the application gives the website a score out of 100, and identifies issues you need to fix to get higher page load speed. 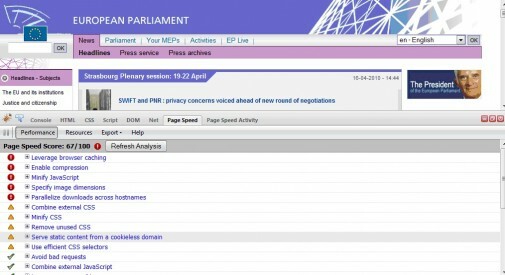 Look, the European Parliament’s website has a few issues. Gus: OK, apart from page load speed, how would we get an alert if one of our client’s website went down? Vlad: I would use a low-cost service like ChartBeat or Montastic to monitor server availability – it’s going to be a lot easier than trying to spot times in the middle of the night when visitors have gone down to zero. Alternatively you could set up custom alert in Google Analytics but that doesn’t monitor number of visits by the hour, only by the day. 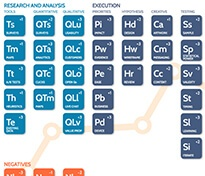 Gus: What other KPIs would you monitor? Vlad: As I said, the number of Error messages that the website is producing, such as 404s. Gus: Can you report on that from Google Analytics? Vlad: Not currently, but you can modify the Google Analytic Tracking Code to trap the number of these type of error pages. Gus: And then what do you need to do? Vlad: You use the Navigation Summary report in Google Analytics to see what was the previous page before the Error 404 page. 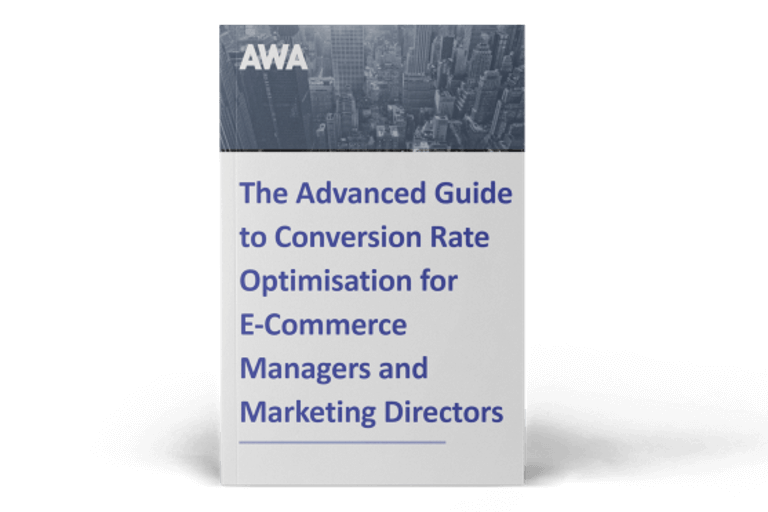 Gus: I suppose another way you could look at the site is to examine the conversion rate, assuming it is an e-commerce site, by browser type and connection speed. If there were any large differences in conversion between different browsers and connections versus the average conversion rate, then you might say that the website isn’t serving those using certain browser and connection speeds very well. Gus: I know this is supposed to be all about technical parts of the site, but one other KPIs I would want to look at under this heading, is the number of failed searches. Gus: Those searches that result in no matches found. Vlad: That doesn’t come out of the box with GA does it? Gus: No, but ROI Revolution have suggested an easy way to capture the search term used in and number of times you get a failed search. But it does require some changes to your GATC code. Vlad: So, what are we going to capture now for our client? Vlad: Great. I let you put all that data together for the next meeting with the client. 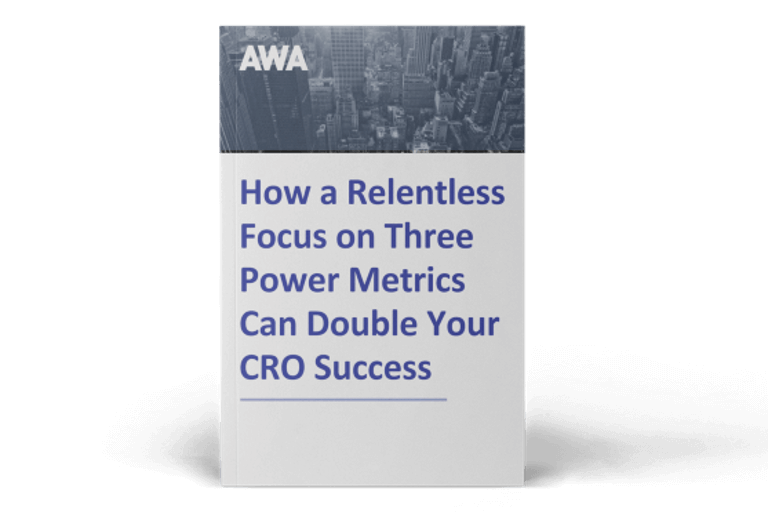 If you're unsure on what KPIs you should be using, read our ebook below to find out how a focus on three power metrics can double your CRO success.